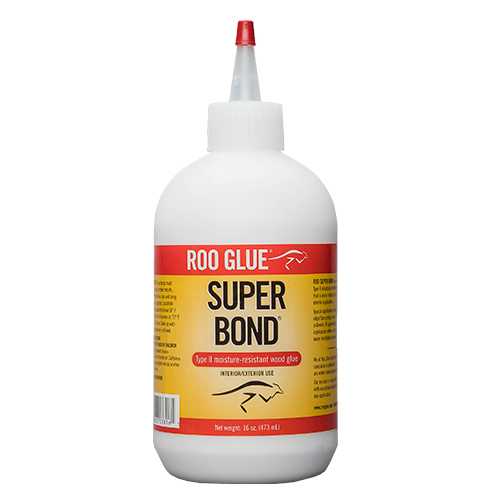 Roo Super Bond is an easy-to-use water-based PVA wood adhesive. It exceeds Type II water-resistance testing, so you can feel confident using the glue in a variety of applications. Roo Super Bond has exceptional heat resistance, dries fast and dries clear. it is available in white or yellow. Roo Super Bond can be used in a wide range of applications such as edge and face gluing, finger jointing and veneer laminating. Typical end uses range from furniture part assembly and millwork applications to countertops and everything in between. All surfaces must be clean, dry and free of grease and oil. Super Bond should be used as supplied. Apply the glue evenly to one surface and bring together while still wet. Recommended clamp time is 1 hour at 70° F.
I have been extremely pleased with Roo Super Bond. It goes on smoothly, has good working time, works very well in a variety of applications and has yet to fail in any of the difficult applications I’ve tested it on. I even used it to glue on the side mirror glass in my 16 year old girls Volvo. It’s working much better than other adhesives I’ve tried. Bravo!